Airforce Delta, known as Deadly Skies in Europe, is a video game released in 1999 for the Dreamcast. It was both developed and published by Konami. The game is a 3D aerial combat simulation, featuring many jet fighter aircraft. The game is single player only and has been compared to Ace Combat by GameSpy and GameSpot. 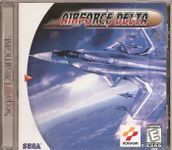 At the time of the game's release, Airforce Delta was the only combat flight simulation game available for the Dreamcast. A Game Boy Color version of Airforce Delta was also released in 2000. A sequel called Airforce Delta Storm in North America (Airforce Delta II in Japan and Deadly Skies in Europe) was also released for the Xbox platform in 2001 and for Game Boy Advance in 2002. A second sequel called Airforce Delta Strike in North America (Airforce Delta: Blue Wing Knights in Japan and Deadly Skies III in Europe) was released for the PlayStation 2 in 2004. Airforce Delta features simplistic controls with an emphasis on arcade-style action rather than accurate flight simulation. The mission briefings are complete with an illustrated step-by-step guide which shows you your designated targets and the ideal path to take. After completing a mission, players are awarded with money that can later be used to purchase superior aircraft. Variables such as mission completion time and the number of enemies you have disposed of dictate the amount of money you will receive. When making a buying decision, choosing an aircraft most appropriate for the job is of the utmost importance. The most expensive does not necessarily mean the most practical. Missions typically involve either seeking out and destroying the enemy or escorting friendly craft to a certain destination. The enemies encountered in Airforce Delta are diverse and range from air to ground and water capabilities and from offensive to defensive situations. Mission maps are based on real world locations, such as downtown Chicago and the Great Wall of China. Airforce Delta features over thirty aircraft to take for a test flight. They are all based on real life aircraft both in looks and in handling. Some of the planes available for these missions include the F-4 Phantom, F-14 Tomcat, A-10 Thunderbolt, Mig 29, Su-27 and the top secret F-22 Raptor. Source: Wikipedia, "Airforce Delta", available under the CC-BY-SA License.